Force majeure means “superior force” and, in a legal context, it’s a specific clause added to various contracts to address potential unforeseen circumstances that would prevent someone, or a business, from fulfilling their end of a contract. It’s common in meeting contracts and IT service contracts, but it’s often misunderstood and misused. Because force majeure clauses are so misunderstood, it’s crucial you have important contracts drafted by a skilled Washington D.C. business litigation attorney. Large scale disasters, especially those related to terrorism and weather, are some of the circumstances that are typically covered under a force majeure clause. Natural disasters like earthquakes, floods, hurricanes, and other massive weather disturbances have been labeled as “acts of God” in many contracts. Other potential disasters center around war, terrorism, health outbreaks, travel strikes, and more. In regard to meetings, any event that prevents a certain percentage of attendees from being able to make the meeting may be covered by force majeure. It’s important that whatever activities you want protection from, you spell out in detail. Courts tend to view these types of clauses in the strictest sense, so if you include terrorism and you breach your contractual duties over a “threat” of terrorism, you are likely on the hook for the other parties’ damages. Even a well-drafted force majeure clause may not be enough to absolve you of liability. For example, a company that offers software related services to customers still has an obligation to have a business continuity and disaster recovery plan in place. How does this company plan to restore services if a hurricane hits the region? You can’t hide behind a force majeure clause as an excuse to get out of your business obligations. A court is likely to look at the particular circumstances. Should the vendor have anticipated the event and taken certain steps that would’ve mitigated the risk? After the event, did the vendor undertake reasonable efforts to restore service to its customers without further delay? Each situation is different, and using boilerplate language for any clause that can put your business at greater financial risk is not recommended. You should look at your individual situation and what the contract covers. Are you planning a meeting for 500 people during the winter? If there is a chance that attendees may struggle getting to this location on said date, be clear on that issue. The risk of snow in winter is not enough to qualify as justification for not holding the meeting. You should look into separating clauses that cover acts of God versus other situations that someone else does have control over. That might be renovations at a conference center, a hotel closing or changing ownership, labor union disputes, etc. 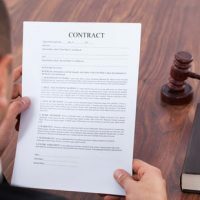 In addition, it’s important to know that you cannot hide behind a force majeure clause to get out of a bad business deal you made a mistake on. Having the right Washington DC attorney can make a huge difference in a contract dispute matter. The attorneys at Tobin, O’Connor & Ewing have over 20 years’ experience handling business disputes and other legal matters for both small business and larger corporations. Contact our office at 202-362-5900 to schedule a consultation today.